Fold bias tape in half lengthwise and press. Stitch folded bias tape to right fabric side of neck edge so that folded edge of tape lies on garment piece, 1 cm (3/8 in.) past seam line. Trim seam allowances. Turn bias tape to inside. Sew inside edge of bias tape in place by hand. Making folded knit hem tape is not nearly as clever as making continuous bias binding. (I've actually never made continuous bias binding, but it looks fun, and I'll make it one day when I have need for such a thing.) I find the act of making knit hem tape before it's actually needed to be quite relaxing, and it's super nice to have on hand. I used flyweight cotton rib to make my most recent batch. In the past I've used lightweight rayon jersey or nylon mesh. Making it with a rib fabric is easier, because the rib doesn't roll at the edges. I also prefer the feel of the flyweight cotton rib. I've sometimes cut the flyweight parallel to the ribs (the least stretchy direction) when I wanted to contain the stretch of the sweater knit edge a bit. This time I cut the hem tape perpendicular to the ribs (the more stretchy direction). I bonded the layers together to hold the fold and make it easier to sew to the sweater knit. There are many variations; this is how I made the tape pictured above. Preparation: Wash and dry flyweight cotton rib. Square off fabric by trimming an edge perpendicular to the ribs. Step 2. With the iron set to "#3 Polyester" and no steam, I pressed tape along edge of the fabric for no more than 2 seconds per section. Step 3. After fabric became cool to touch, I peeled off the paper backing. Step 4. Next I folded up the edge. 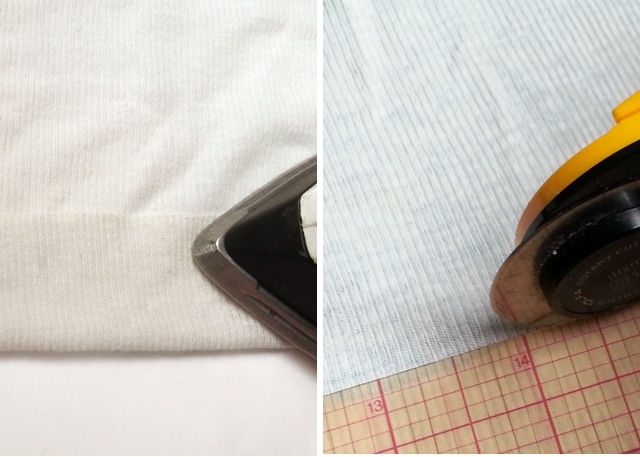 The width of the hem tape is determined at this point. I made mine about 1 1/8 inches. Step 5. 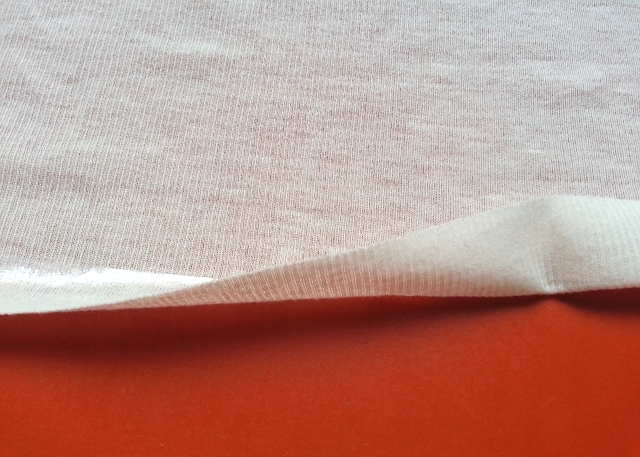 To bond the folded edge, I pressed without steam and the iron at "#3 Polyester", this time for about 6 seconds per section. Step 6. I placed the rib fabric on a cutting mat and cut the folded edge with the rotary cutter. The resulting folded knit hem tape is stretchy. The raw edge was sewn to the raw edge of the sweater knit and then seam allowances trimmed. I'll sometimes steam the seam allowance toward the tape and stitch the seam allowance to the tape with a zigzag, before hemming. 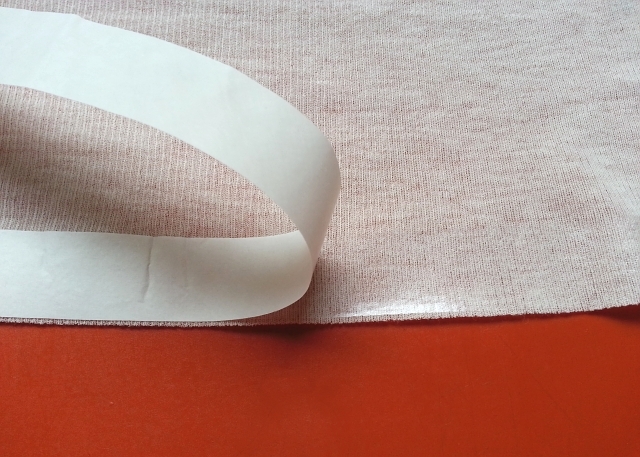 The permanently folded tape edge makes a nice reliable edge for sewing hems by hand or machine. 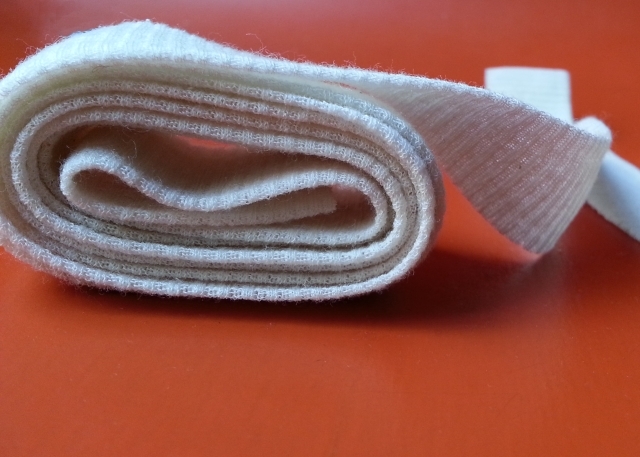 Folded knit hem tape is not fancy or difficult to make. It's just a little thing and so worth the effort. 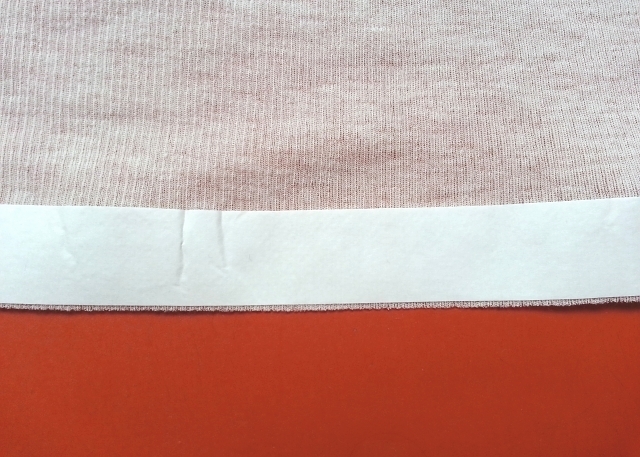 ETA: You can see the folded knit hem tape sewn to sweater knit and ready to be hemmed here. Just what I needed to read this week since I need to make a binding for a sweatshirt. Thank you for sharing. I think I understand this, the cotton flyweight ribbing (I can't see it anywhere in Australia) is a lightweight knit that you use as a base to create the binding, is that correct? I have some fine merino wool knit that I was wondering I could use this instead. I understand the rest of the bonding, cutting and stitching to the garment. I am planning on make a long cardigan with a sweater knit and feel this would be perfect for both the centre front and hems. Yes, Sharon, the flyweight cotton ribbing is used because the flyweight means it's lightweight enough to use double, and the balanced rib means the edges won't roll. Technically I'm using it here as a tape, rather than folding it over a garment edge as a French or double binding. Fine merino wool knit sounds as if it would be great for your application, as long as it's light enough. If it's not lightweight enough, you could probably just use a single layer and just turn down the edge. How nice to have all that fine merino wool knit available to you! Looking forward to seeing your long cardi!